Research Fellow, Harry S. Truman Institute for the Advancement of Peace, The Hebrew University of Jerusalem; Research Fellow, ICT, IDC Herzliya; and Affiliated Fellow, KITLV/Royal Netherlands Institute of Southeast Asian and Caribbean Studies, Leiden. Dr. Eliraz holds a PhD from the Hebrew University of Jerusalem. 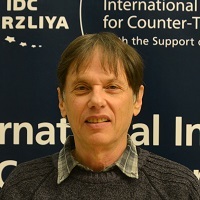 He is a Research Fellow at the Harry S. Truman Institute for the Advancement of Peace at the Hebrew University of Jerusalem, Research Fellow at the Institute for Counter-Terrorism at the Interdisciplinary Center Herzliya and Affiliated Fellow at KITLV/Royal Netherlands Institute of Southeast Asian and Caribbean Studies in Leiden. Dr. Eliraz is also a member of the Board of Trustees of the Strategic Dialogue Center at Netanya College, Israel. Dr. Eliraz teaches at the Division of Graduate Studies, Rothberg International School at the Hebrew University of Jerusalem. His previous academic and professional activities include: Visiting Fellow at the Southeast Asia Centre, Faculty of Asian Studies at the Australian National University in Canberra: Israel Prime Minister’s Office. Israel Defence Forces. Rank of retirement: Lieutenant-Colonel. ISIS' (now IS) announcement in June 2014 that it was establishing a Caliphate (Khilafah) with its leader Abu Bakr al-Baghdadi as Caliph was strongly criticised across the Muslim world even by many radical and militant ideologues. Groups and movements that yearn for restoration of the Caliphate strongly rejected the idea that one single Muslim group can monopolise the right, believed to be entrusted to the entire Muslim Umma or nation, to create one. Similarly, al-Baghdadi, the self-proclaimed Caliph, has been portrayed by critics as a fake, bogus Caliph. Some Muslims also wondered, on varied media platforms, if al-Baghdadi intends to declare himself also as "the expected Mahdi" (al-mahdi al-muntazar); a few even derogated him as false Mahdi. Egypt will find it hard to avoid deep dichotomy and bitter polarization between secularism and Islamism. Indonesia has asked in recent years to be more involved in Middle Eastern affairs by playing the role of mediator and peacemaker.